Just out of curiosity, why is the Authenticate Panel for Xfce so big in Antergos, but not in other distros? I went distro hopping for fun, and I’ve installed Antergos w/Xfce twice just make sure I hadn’t done something wrong. It’s about twice the size of normal panels in width, and it doesn’t matter what theme I’m using, either. every distro has removed the use of gksu but you can still install it even though most developers say it’s a security risk using it. i’m in my mint 19.1 xfce now where i do not have gksu installed but trick the system thinking gksu is installed but using an alias to pkexec. does pkexec env DISPLAY=$DISPLAY XAUTHORITY=$XAUTHORITY HOME=$HOME gedit open a smaller window? Hi. Unfortunately, that did not work. It isn’t a big deal, but just curious. ah, yes now that i am in arch linux i see the password dialog is large same as yours. An authentication agent is used to make the user of a session prove that the user of the session really is the user (by authenticating as the user) or an administrative user (by authenticating as an administrator). 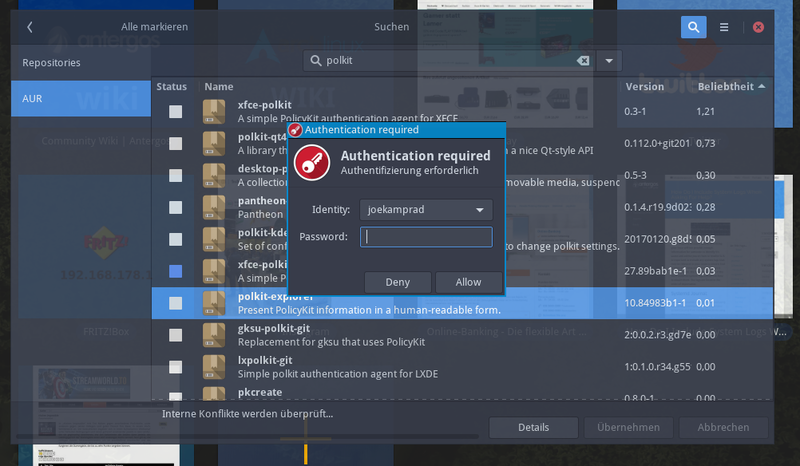 The polkit package contains a textual authentication agent called ‘pkttyagent’, which is used as a general fallback. Well, what do you know? It wasn’t installed. I installed it from Package Manager and restarted…Voila! Beautiful! Thank you. I wonder why it doesn’t automatically get added when you do a fresh install? And, ahem…what is that theme you’re running? Beautiful! @joekamprad Thank you, for the explanation and the theme info. Have a great weekend!